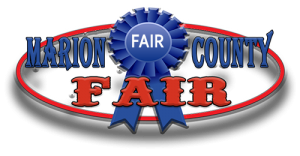 The 2018 Marion County Fair will be a three-day festival filled with carnival rides, nightly entertainment, industrial, commercial and agricultural exhibits. 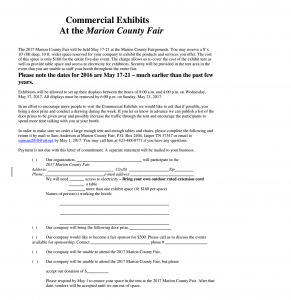 The Marion County Fair Board has established a venue to specifically highlight products and services available to the citizens of the Marion County area. This is an excellent opportunity to demonstrate the many and varied products produced and services provided in Marion County and surrounding area. 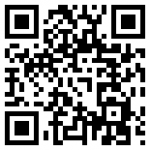 Please take this opportunity to consider having an exhibit at this year’s fair . . . 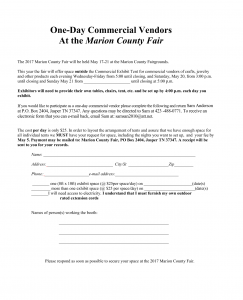 In order to make sure we order a large enough tent and enough tables and chairs, please complete the following and return it by mail to Sam Anderson at Marion County Fair, P.O. Box 2404, Jasper TN 37347 or email to samsan2010@att.net by Sept. 14th, 2018. You may call him at 423-488-0771 if you have any questions.